For his sister, Detective India Kane, it's an added complication in a far more sinister crime - a series of brutal murders the missing hit-and-run victim could hold the key to solving. With a mutilated corpse on her patch, and the dead woman's identity shrouded in secrecy, India's set on a collision course with a deadly, unknown enemy. Her lover, Detective Chief Inspector AJ Colt, is well acquainted with the enemy - courtesy of a divisive high-profile case, he's currently public enemy #1. As cultures clash, simmering tensions explode, bringing terror and bloodshed to the streets, and placing Colt firmly in the sights of some of the country's most dangerous and deranged individuals. When one of them brings their work home, nothing will ever be the same again - for the wages of sin . . . is death. Her vision blurred as her gloved hands fumbled with the combination lock securing her bike. She swiped at her eyes, kidding herself it was the brightness of the morning making them run. It wasn’t, it was self-pity. She didn’t want to go back there, not today. The constant drunken comings and goings were becoming increasingly unnerving as more workers arrived. Naz had sympathised, but she couldn’t help. Couldn’t make it better, easier, or safer. With property prices high and funds low, she knew she should be grateful for a job and a home, but today she was struggling. Today she wanted more. She wasn’t sure she could stand this one. Her breath caught in her throat as the emptiness and isolation she faced overwhelmed her. She wanted to be brave, as brave as Naz, but she felt weak and lonely and lost. Discreetly dabbing her eyes with her new scarf, she took a furtive glance back at the building. Naz stood at the window, watching her. With a half-hearted smile, she dropped her backpack at her feet to fasten her bicycle helmet. Naz smiled back and pressed a hand to the glass. In the time it took to pick up her backpack and hook it over her shoulders, Naz had gone. With a heavy, resigned sigh, she pushed her bike down the long shingle drive to the entrance gates. Once outside she propped the bike against the kerb and cautiously glanced up and down the quiet tree-lined avenue – almost jumped out of her skin when a car door slammed somewhere up ahead. Seeing a blue light poking up from the row of parked cars, she pressed herself into the shadow of a tall oak tree, heart stuttering in her chest. Her eyes followed the police officer as he strolled across the road and let himself into a house. he didn’t know a police officer lived there. She didn’t know she’d been holding her breath either, until it juddered from her body when the door shut behind him. Hands trembling, she drew a deep, steadying breath, mounted her bike and set out for the short journey home. Home. Memories stabbed at her heart and stung at her eyes. She shook them away as she cycled onto the main road and into the safety of the crowded morning traffic, feeling her shoulders finally relax. Relaxation was dangerous. Naz said it would get her killed. The words echoed in her head, causing her body to tighten once more. Gritting her teeth, she pedalled harder. Kept her head down as she passed the last of the picturesque shop fronts adorned with nice things she’d never own, and concealing aisles she’d never browse. She hated this life. Wished so much that she could go back, back to before she knew. But now that she did know, back wasn’t an option. Her only option was forward. Her only option was to run. At first, the angry chorus of blaring horns seemed normal background noise, the same as every Monday morning approaching the Winchester bottleneck. It was the sound of a high revving engine that had her glancing over her shoulder to glimpse a white van pushing aggressively through the traffic. Her mouth went dry. A white van. There were probably millions of them, billions even. It was probably nothing, just the bog standard enemy of regular road users trying to get ahead, but she never knew when or where they would come for her. And she knew what they’d done. Knew what they were capable of. As a precaution, she bumped her bike out of the bus lane and onto the pavement, meandering slowly and carefully, wary of the pedestrians heading her way. Behind her she heard the prolonged guttural torque of an engine racing at breaking point. A split second later, a single heartbeat, her world span upside down in a silent slow motion strobe of black and white as she rotated endlessly past trees filtering sunlight. This is it, she thought, spinning through the air. This is The End. It wasn’t how she’d imagined it to be. And she’d imagined it a million times. Thought it would be painful. They’d promised it would be painful. They’d given her every graphic gory detail of how her end would be. But it was nothing like they’d promised. A serene sense of calm engulfed her as she closed her eyes and accepted her fate, her everlasting freedom. Excerpt from The Wages of Sin by Bo Brennan. Copyright © 2017 by Bo Brennan. Reproduced with permission from Bo Brennan. All rights reserved. Bo Brennan is a 'Crime Thriller' writer who has lived and worked in various locations. None were exotic. Bo's favourite past times are reading, writing, and eating. Unfortunately, the three combined do nothing for the waistline so moving about occasionally is a must. Bo's debut novel, STEALING POWER, is the first in a series of chilling crime thrillers featuring British Detectives India Kane and AJ Colt. BABY SNATCHERS is the second. THE WAGES OF SIN is the third. Bo’s books can be read in sequence or independently . . . but are probably best read with the lights on. Catch Up With Bo on Goodreads, Twitter , & Facebook ! This is a rafflecopter giveaway hosted by Partners in Crime Virtual Book Tours for Bo Brennan. 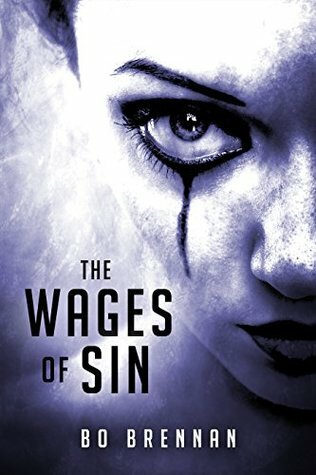 There will be 5 winners of one (1) eBook copy of The Wages of Sin by Bo Brennan. The giveaway begins on February 12th and runs through February 22nd, 2017. Thanks a million for featuring my book, Frishawn! Have a great week, Bo.